In a Nutshell: Access to books can be a major factor in whether kids learn to enjoy reading early in life, which can lead to a higher degree of academic achievement and success later in life. Little Free Library is an organization that helps inspire a love of reading by promoting neighborhood book exchanges and community participation in fostering literacy. Starting a Little Free Library in your area is easy and can bring neighbors together in collaboration around reading, sharing ideas, and fostering a vibrant community. For as long as I can remember, I’ve loved reading. I still vividly recall reading the Step-Up Books, Meet the Presidents, Meet the North American Indians, Meet the Great Explorers, and others as a child. I truly believe that my love of reading gave me a great head start in school, and I’ve always attributed my successes in life to an avid curiosity for the things I could learn from books. Perhaps that’s why I was so excited the day I learned about the Little Free Library movement. I was walking through my quiet residential neighborhood and came across a couple of guys putting the finishing touches on a small structure. It was an attractive little box with a peaked roof and a paned glass door that looked in on three shelves. When I asked, one of them told me it was a Little Free Library and then explained what that meant. I was warmed by the idea of people sharing books with one another, and also excited at the prospect of being the first to add some books to the box. Making my way home, I went straight to the garage and dug around through the box where we keep books to donate or to give to friends. I came up with a dozen or so that I thought would make a great inaugural donation and headed back out with the books tucked under my arm. As I rounded the corner and approached the house, I was surprised to see five or six of my neighbors already standing there chatting, with books in their arms or in boxes at their feet. I smiled. OK, so I wasn’t going to be the first to donate to our little community library, but somehow that didn’t matter a whole lot to me right about then. The first Little Free Library was constructed by Todd Bol in 2009 in Hudson, Wisconsin, as a memorial to his mother, who was a school teacher and lover of books. His design was made to look like a one-room schoolhouse set on a post sunk into the ground. The idea was quick to catch on, and less than 10 years later, there are Little Free Libraries in all 50 states and in 84 countries around the world — more than 65,000 in total with an estimated 47.5 million books exchanged each year. Margret Aldrich is in charge of media and programming at Little Free Library, and we recently had a chance to chat with her about the nonprofit group’s success, and the impact it has had on communities around the globe. As Americans, we are privileged to live in one of the wealthiest nations on the planet. However, not everyone shares in the wealth and prosperity equally. The gap in earnings between those at the top and bottom of our economic ladder — the so-called income inequality gap — is as wide as it’s ever been. So what’s the reason behind this disparity? A study conducted by the Federal Reserve Bank of St. Louis in 2015 showed wealth is strongly linked to education. It found that people with advanced degrees were 50 times more likely to build wealth of $1 million or more than someone with just a high school diploma. It also found that an individual with a graduate or professional degree held 95% more wealth than someone without a high school diploma. While these findings may not come as a surprise to most of us, it’s this next connection that’s the most interesting. Researchers in Canada recently used data from the International Adult Literacy Survey — a survey that assessed the literacy skills of individuals in 23 developed nations, including the US. One of the survey’s findings was that literacy and education are directly correlated and that individuals with higher literacy levels had measurably better earnings than those with lower literacy. “Our mission is to really inspire readers of every age, to build community, and to spark creativity,” Aldrich said. In other words, the goal is to foster a love for reading by providing greater access to books, which leads directly to higher literacy rates. And the earlier we develop an interest in reading, the greater the likelihood of academic success. If the idea of building community and helping others develop a love for reading sounds appealing, then you may want to start a Little Free Library book exchange in your own neighborhood. There are essentially two ways to go about it. Aldrich explained the options and the process during our conversation. For handy DIYers, or as a community project, designing and building your Little Free Library can be both fun and rewarding. The young engineers from the PBS Kids Design Squad have a great video showing the entire process of how they designed, built, and installed a Little Free Library at the Columbus Elementary School in Medford, Massachusetts. Whichever way you decide to go, DIY or prefab kit, there are five easy steps in getting your mini library up and running. 1. Identify a Location and a Steward. 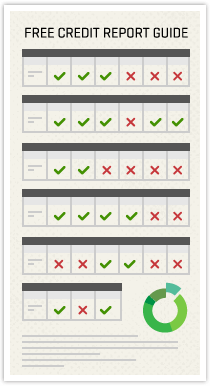 The location you choose should be safe and easy to access. It must also meet any zoning requirements for where you’re installing it. Finally, you need to select a steward, or the person who will monitor and care for the library once it’s installed. 2. Get a Library. Building your own Little Free Library can be a great way to involve the community where it will be installed. Ask around for anyone with carpentry skills who can direct the project. If you prefer to order a prebuilt Library or kit from the organization, there are many different styles to choose from. 3. Register Your Library. If you order a Library or kit from the organization, it will be preregistered and will arrive with an official charter plaque. If you build your own, you will need to register it. Once it has been registered, you will receive your charter number and plaque from LFL that lets folks know you’re official, as well as a resource guide and other perks. 4. Build Support. Letting the community know that they now have a Little Free Library is a crucial step in getting support and participation for this resource. Tell friends, post signs, even go door to door if that’s practical. The more neighbors who know it’s there, the more vibrant and successful it will be. 5. Add Your Library to the World Map. One of the benefits of registering your library is inclusion in the World Map of Little Free Library locations. Consider having an opening ceremony and inviting neighbors to celebrate your contribution to the community. If developing an early interest in reading can lead to higher levels of literacy, and if greater literacy leads to more education and greater earnings potential, the connection is clear. Access to books can change lives. 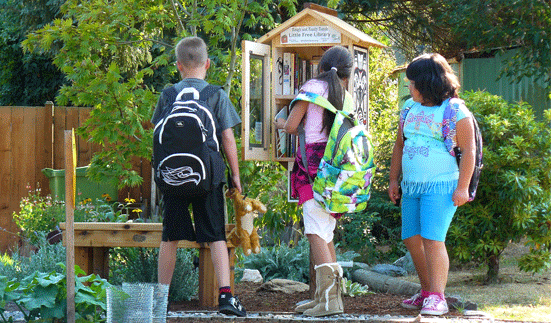 Children pay a visit to a Little Free Library location in Mountlake Terrace, Washington. The Little Free Library organization is also working with schools and public libraries to ensure children have books available when they want them. And these institutions have access to discount pricing when ordering kits and pre-made structures. Whether you live in a neighborhood with convenient access to books, or one that may be underserved, starting a Little Free Library is a great way to serve your community. It can bring neighbors together, act as a community meeting spot, and can help foster communication and dialog. I know the Little Free Library in my neighborhood is a place that people value and respect.